Pat Metheny has always been one of my heroes. With Michael Brecker as a saxophone hero in the 90s, you really couldn’t miss Pat, as he was on many of Brecker’s albums, and vice versa. Well, as I’m sure most of you know, we lost Michael on January 13th, 2007, breaking this duo up for good. While Brecker will be greatly missed, it seems Metheny has found a new saxophone virtuoso to work with. This time, Chris Potter is taking the tenor chair. Needless to say, the match is fantastic. 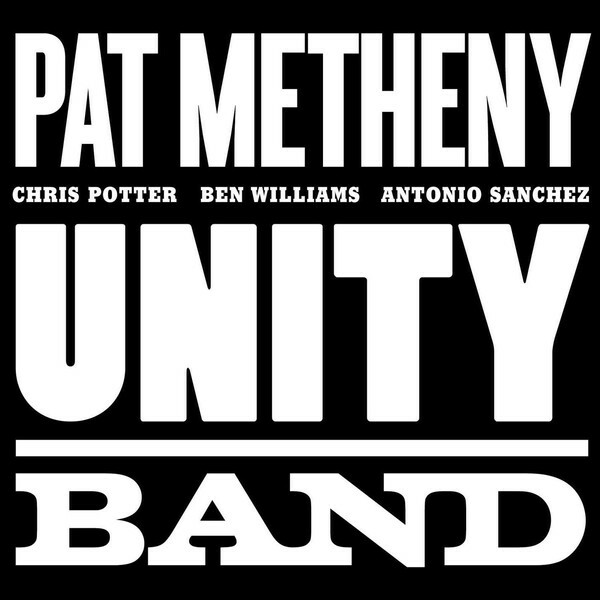 Their CD Unity Band is an explosive, dynamic and complex recording featuring Pat’s usual melodic, folk rock infused compositions and extraordinarily technical solos. To add to the weight of the album, Antonio Sanchez and Ben Williams make for a fantastic back line. I was inspired to pick this track due to the band’s impending concert, this Saturday (the 29th) at Mesa Arts Center. It promises to be amazing. I can’t wait! This is the first track from Unity Band, called “New Year”. It’s a latin tinged composition with twisting harmonies. After a quasi-classical rubato guitar intro by Metheny, the head enters, loosely playing off a quarter note triplet theme. Pat’s solo is surprisingly understated, probably due to the acoustic guitar, but very melodic and smooth despite the colorful harmonies. This solo is masterclass on arpeggios. His opening lines (at D) are sweeping, unadorned outlines of the harmonies. And in the rare moments he veers away from that, he contrast them with elegant melodies and lightning fast displays of his bebop chops. Its a very refined solo, even for Chris. Measure 147 begins one of those bebop displays. Check out the slick pivot from concert A-7 to C-7, with a strong implied F7. Chorus (E) shows off some development with a triplet run that meticulously outlines the changes. Note where he places the starting and ending notes of each grouping. 169 is a playful line that has the feel of a Rousseau classic etude and is played in a similar fashion. I love the ear-twisiting shift to the G-∆7. The coda (starting at H) takes the alternate end of the 2nd solo chorus form and turns it into a 14-beat loop. As always, Chris’s ability to navigate these shifts in meter is flawless. Check out the double-time moment at 271! This solo is probably one of the more straight ahead ones to draw ideas from. The lines are perfectly on the chords, the changes, while unusual, follow a lot of logical patterns, and many of the juiciest moments land on common sequences of chords. So instead of practice tips, I’m going to suggest you just dig in and steal to your heart’s content. See you at the concert on Saturday! This entry was posted in Jazz, Transcription. Bookmark the permalink. Thanks for posting this transcription. I love Chris Potter as well, so I also transcribed this solo. I can see I made a few mistakes with the chord qualities and interpreted a few of the rhythms incorrectly or slightly differently to your transcription. It’s really nice to have someone else’s take on the solo to A-B and see how one could have done things slightly differently. Looks like we enjoy similar music and sax players (I’ve also transcribed one or two that you have on your transcription page and dig Soundgarden). I’ll keep an eye on your blog. Thanks Dan! This was a fun one. I’m not 100% on the chords, but I picked Metheny’s solo guitar intro before grabbing Potter’s solo. These chords are based on what he played there, combined with the bass notes during the head. They sound very accurate to me and I’ve been using them when playing the tune live. And with Potter, as clean as he plays, there’s always some rhythms that are tricky to put on paper. I’d be curious to see your version if you ever cared to share! One of the best site for sax music. The author is really great. Great post.